British soldiers arrive on an Adriatic island during the Second World War, only to discover a group of German troops already stationed there. Both sides declare a truce so they can enjoy their luxurious surroundings instead of fighting, but the arrival of a female castaway stirs up tension in the ranks. 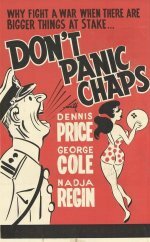 Comedy, starring Dennis Price, George Cole and Nadja Regin.